Surgery is a difficult clerkship. A couple years after you finished up with your cadaver, you’re expected to remember anatomy. You’re pimped about medical management of different post-op patients; you’re asked about Courvesier’s Sign. The surgeons are usually intense. You are often waking up at 4, and getting home 12 hours later on a good day. So, not only is there a lot to know, there isn’t much time to study. To make matters worse, the surgery shelf exam is difficult. And make no mistake, it has a lot of medicine on it – not all the esoteric blood vessels you were asked about during those long cases. What do you do? You do your best. And you use the resources below. These are the best surgery books for medical students. I would suggest DEFINITELY reading the first one. The others are helpful, but may be overkill depending on how much time you have to study. Surgery: A Case Based Clinical Review by Christian de Virgilio is the best surgery book for medical students. This is your bible. You may have heard that Pestana’s is the way to go, but this (relatively new book) was hands-down the best text I used during my surgery rotation, and likely of any clerkship. It’s is extremely well-organized. It goes into the right amount of detail for us medical students, and it covers the medicine necessary to know for your surgery shelf exam. The textbook is split into different topics (e.g., trauma, head & neck, upper GI, lower GI, etc). Each section has two or more chapters that open with a patient presentation. The text then dissects and expounds upon the case by posing a question and then answering it. It’s like you’re being pimped by the book. This book also has a number of excellent NBME-styled questions in the back of the book that cover each topic; they are perfect for reinforcing the information. I swear every question I was asked in the OR/on the wards, and most I was asked on the shelf, was in this book. It may seem a little long to get through (~589 pages of text) but there is a lot of blank space in the book; the chapters are fairly short and read quickly. I would suggest reading the chapters that pertain to the service you are on (e.g., upper GI and lower GI if you’re on the general surgery service) first, and then reading the others. Try to read one or two chapters a day while you’re at the hospital – you most likely won’t be up to it after a long day! 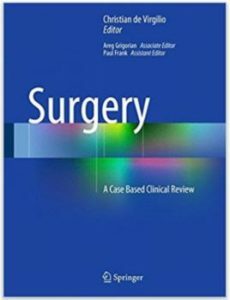 In summary, If you’re going to buy one resource for surgery, De Virgilio’s Surgery: A Case Based Clinical Review is it. 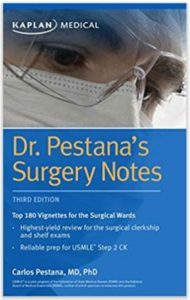 Pestana’s is a classic book for the surgical clerkship. I think it is excellent for what it is: a condensed overview of surgical information. Thus, I do think it is one of the best surgery books for medical students, but it should not be your primary text for surgery (De Virgilio is what you’ll use). Instead, I this is a great resource to read the weekend before or during the first few days of your rotation. It’s a quick read and will give you a good background to drive in more detail and more medical management that is in De Virgilio. You can also read this text again a few days before the shelf to help review. It also contains 180 multiple choice questions in the back of the book. However, you have to flip back to the section of the text that has to do with the question to get any explanation. I feel like De Virgilio’s text and UWorld are better places to start – use these questions as a supplement (Pro tip: if you didn’t buy Pestana’s, but want to do some of the questions, a lot of them and the answers without explanation are available on Amazon’s preview). 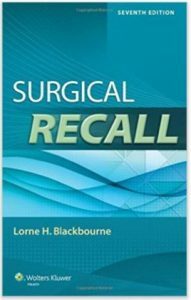 Surgical Recall is another fairly popular book for the surgery clerkship. It covers a lot of ground, and is very helpful for your time in the OR. Here’s the thing: it’s long and you only have so many hours in the day. My suggestion would be to stick with De Virgilio’s for your shelf. However, Surgical Recall can be helpful with some of the pimping that happens in the OR. The best way to use this book is not really as a cover-to-cover read, but as something you read before a case that you have the next day. This book also goes over some of the more practical knowledge in the OR (tips for rounding, types of instruments, suture tying, etc.) which may be helpful for you in terms of getting comfortable during the clerkship. If this sounds like something that would be helpful for you, then go for it. Although maybe not as useful for the shelf, this is still one of our recommended surgery books for medical students.